Coordination Chemistry Reviews, 2017, 334, 199–231. First published online 26 Oct 2016. Paper on the publisher’s website. Analysis of the Cambridge Structural Database (CSD) revealed over 1200 metal carbonate compounds. At least 130 of them can be described as molecular mono- or polycarbonate metal cage complexes. The formation of most of these structurally diverse compounds is a classic example of serendipitous fixation of atmospheric CO2. Only a small number of compounds of this type were obtained by the intentional addition of Na2CO3, NaHCO3, or other simple carbonates as precursors of carbonate anion. 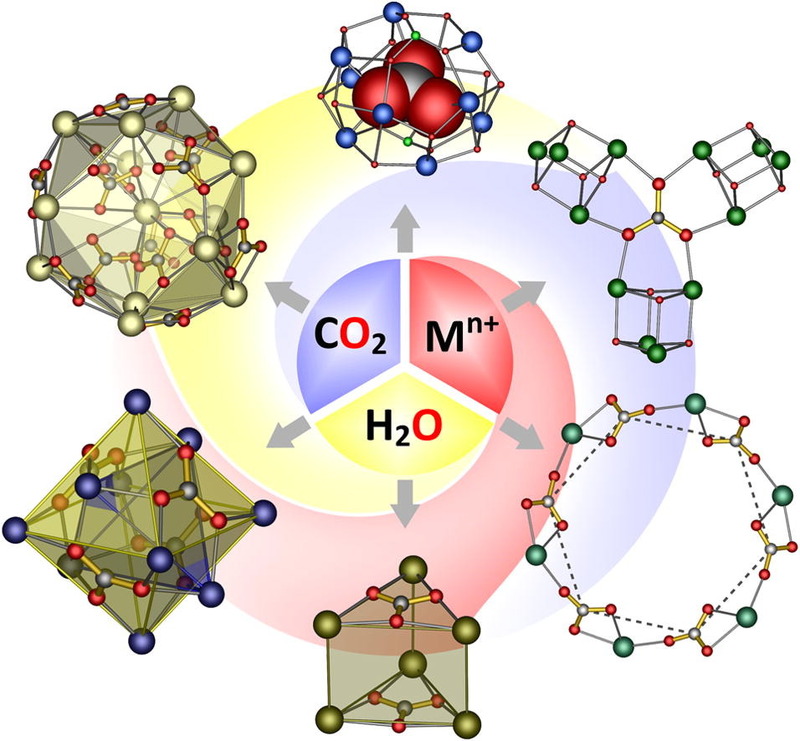 This review article outlines a great potential of CO2 fixation in various inorganic reaction systems as an important pathway to novel entities based on mono- and polycarbonate metal cores. Particularly we focus on: (i) structure and chemistry of carbonate anions and common pathways leading to their generation in inorganic systems, (ii) multinuclear cages with ability to encapsulate CO32- ions, (iii) metal clusters templated by carbonate anions and (iv) carbonate anions as building units of macrocyclic and closed polyhedron systems. This review can be regarded as a flexible guide to the classification of these systems. We present an unusual diversity of molecular structures of metal carbonates derived from the chemical fixation of CO2, and describe composition and geometry of a variety of metal carbonate cores. Unique features of the carbonate anion, i.e. the geometry, low steric hindrance and ability to form a plethora of coordination modes, make it a universal templating agent mediating the formation of a variety of multinuclear aggregates ranging from macrocyclic systems to closed polyhedra. There are also provided some insights into interesting reaction systems, in which the reaction outcome strongly depended on the carbonate’s source. The benefits of usage of CO2 as a precursor of carbonate anions are also delineated. When relevant, aspects related to materials chemistry are presented. We believe that the collected results offer a perspective and guidelines for the future research and development of reaction systems leading to metal carbonates of high scientific as well as practical value.